The Durango is one of Dodge’s flagship vehicles, and you will have a tough time finding anything wrong with this mid-size SUV. From the elongated racetrack taillamp to the personalized grille, the team here at ALL STAR DODGE CHRYSLER JEEP RAM believes that this is one of the most beautiful vehicles out on the road. 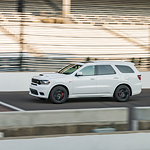 The Dodge Durango was redesigned from the ground up to be a sleek SUV that has an aggressive appearance. In addition to the vibrant LED lights, you can also add Mopar’s iconic stripes that emphasize performance. When it comes time to leave Denham Springs and head off on an outdoor adventure, you are going to have plenty of storage space with the Stow N Place roof rack system. This system will carry up to 150 additional pounds, and the crossbars can easily be removed and packed away when they aren’t needed.